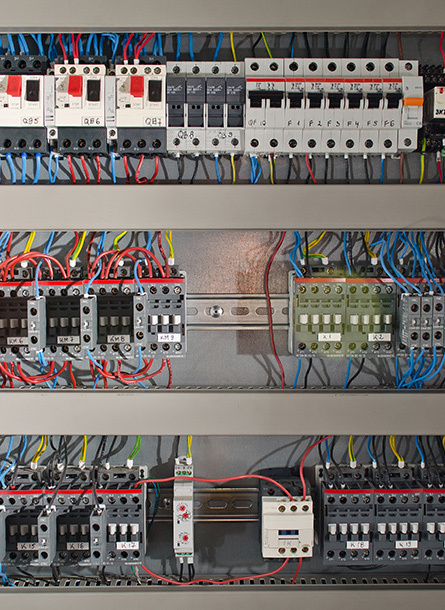 The proliferation of complex electrical systems in modern industrial applications means that DIN rails are used almost everywhere, for mounting everything from a simple circuit breaker to a signal conditioner – or a programmable logic controller, or motor starter. Control panels using DIN rail mountings are found in applications from air conditioning to telecoms, buildings and energy management systems, and many civil and industrial electrical installations. DIN rails at their most basic are a strip of cast metal for mounting an insulated terminal block. The original terminal blocks were invented at the same time as the rail, and designed as a long strip of closely packed wire terminals. The ceramic porcelain block which housed them was enclosed on one side only, in order to prevent potential short circuits in the event of an adjacent block being accidentally installed the wrong way round. The porcelain blocks needed to offer secure housing, but with the possibility for easy removal and repositioning, so the rail was designed with an asymmetric profile into which the blocks could be clipped. DIN rails are coming up on their first centenary of use, since their original invention by a German electrical engineer in 1928. Nowadays almost every major electrical installation will be mounted on one of these electrical device assembly rails, and they are one of the few pieces of electrical equipment which is standard the world over. The name itself is an acronym of the German "Deutsches Institut für Normung", which is simply the name of the German Standards Institute who published the original specifications. These specs were standardised in the 1950s and later adopted by the standards institutions of Europe and North America. The original concept of the rail had a G-shaped profile, which provided a firm mechanical connection, prevented backward installation and allowed for fine positional adjustment of the terminal blocks as they could slide along it laterally. The G-section rail and its components were soon adopted by other electrical manufacturers, and were later joined by the so-called "top-hat" profile design, a symmetrical version of the rail more suited to the mounting of lighter components. This profile eventually became so popular that many manufacturers of terminal blocks made them to be equally compatible with both types of DIN rails. A further rail with a C-section profile was also developed, which is suitable for certain heavier or larger applications, such as transformers or power supplies. The industry-standard 35-mm wide top-hat rail is today the most commonly used for mounting relays, circuit breakers, controllers and other types of electrical equipment. There are two types available, at 5mm or 7.5mm deep, with most of the extant and new mountable electrical component designs being of this type. The 7.5mm is the more cost effective and suits the majority of modern applications, while the 15mm is more suited for the mounting of heavier components. The 32mm wide C or G-section rails were the first generation DIN rail types and are less frequently found in modern designs, which do not require such strength for component retention on the rail. This type of rail is still used to mount larger or heavier components, but may require extra mounting accessories. C-section rails commonly come in four popular sizes, corresponding to their depth in mm: C20, C30, C40 and C50. The 15mm wide mini top hat rail is commonly used for mounting components in compact panel boards, or confined spaces such as a small junction box, and there exists also a 75mm wide configuration for more heavy-duty components. Aside from the three basic profiles, DIN rails come in various types and configurations according to size, materials and coating. Except for those terminals such as a grounding busbar that offer an intentional ground connection, the DIN rail's terminal blocks are entirely isolated electrically from the metal conduction capacity of the rail, whose main function is to ensure that these terminal blocks stay securely mounted. Many DIN rail panels are used for applications in extreme environments such as railways, nuclear plants and factories, so they need to be able to resist mechanical shocks and vibration as well as corrosion. Most DIN rails are made from a steel, stainless steel, aluminium or copper base, with some kind of protective coating such as zinc. These metals are then chemically processed with a chromium solution, which in accordance with pertaining standards for reducing hazardous substances is most likely to be trivalent chromium. What kind of materials are best suited to the DIN rail application depends on its working environment, with different metals providing more or less resistance to corrosion or galvanisation. Stainless steel offers the maximum strength and resistance to corrosion, but is more expensive than aluminium or zinc-plated steel. Anodised aluminium offers more corrosion resistance than zinc-plated steel in humid environments, but is weaker and not as cost effective. Zinc-plated steel offers the best all-round solution for most general applications, providing high corrosion resistance, strength and cost effectiveness. Copper can be used when the rail is designed as a grounding busbar. Since the middle of the last century, DIN rail manufacture has conformed to universally accepted standards, originally set by the German Institute and adopted by the European Union and the National Electrical Manufacturers Association in the US. Australian standards for DIN rails are similar. EN50045/BS6273 governed a 15mm x 5.5mm miniature top-hat rail.